A BP Express garage in 1998. British Petroleum in the UK dates back to the 1960s and they consider themselves to be key leaders in helping the environment. BP are also the UK's largest trader of Liquefied Petroleum Gas (LPG). On the motorway, BP is very common and can be found at a variety of services across the network. They own the main lease at Burton-in-Kendal, Killington Lake and South Mimms, leasing the rest of each site to the operator. BP Express is BP's own-branding for the company's corporate sites, which includes the Heart of Scotland motorway service area. 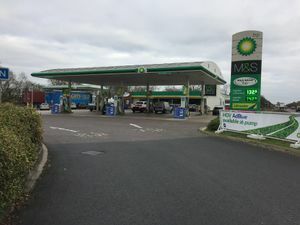 The brand BP Connect is used for some BP forecourt convenience stores, although many have been replaced by M&S Simply Food stores. Most BP Express owned forecourts feature the Wild Bean Café, an own-brand restaurant selling snacks and coffee. 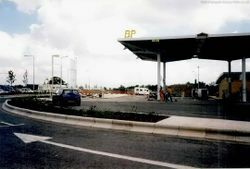 In the 1970s, BP were encouraged to bid to run entire motorway services. They bid unsuccessfully for Michaelwood in partnership with Shell, but did win Anderton and Killington Lake. The brand 'BP Truckstops' was launched to promise "a new standard for truck drivers". It consisted of sites such as Barton Park and Alconbury, and later became Nightowl.